We're talking NBA MVP, and for starters the Cleveland Cavaliers have the 4Th best record in the Eastern Conference, hush the Lebron for MVP talk. This is a 3-Horse race, hence the title; Bean Bryant, KG, and CP3 are the likely suspects and I'm here to break it down for you. It is currently the single greatest turnaround in NBA history, the 07' Celtics finished 24-58 and were openly placing all their eggs in the Greg Oden basket (that worked out well), yet the 08' Celtics would return to glory finishing 66-16 and with the NBA's best record. The reason why could be summed in two words; Kevin Garnett. I'll freely admit the additions of MORE than serviceable bench players, perennial all-star Ray Allen, and the emergence of guard Rajon Rondo all contributed to the miraculous turnaround. Those players were all great but don't result in a 42 additional wins, including straight slapping the Western Conference around to the tune of 25-5. Kevin Garnett's 9 boards a night and 20 points don't seem like MVP numbers, then again no other MVP candidate is playing with future Hall of Famer Paul Pierce & most likely the greatest shooter of the last 15 years, Ray Allen. The Big Ticket has brought basketball back to Boston, one of the top media markets in the country, and THE BEST yes I said it THE BEST franchise in league history. Let us not forget this may not have happened had Garnett still felt the way it was said he felt about Boston; Garnett didn't appreciate the stereotype that Boston didn't respect it's athletes of color, that is a hard thing for any man to swallow and Garnett did so, to win. The Celtics are the top team in the Eastern Conference and in my mind the #1 team in the NBA, not just because they play in Boston but because they are the most consistent team in the NBA, night in night out. Garnett is the court general and the intensity that he brings has rubbed off on everyone from Rajon Rondo to Leon Powe, what other player has made an impact on his team more than Kevin Garnett? 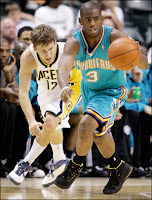 Hornets super guard, Chris Paul, otherwise known as CP3. Anyone who knows ANYTHING about the NBA knows that Chris Paul is the best guard in the best league in the WORLD. In a stretch of 3 years Chris Paul has gone from quality rookie point guard into MVP candidate a.k.a. Steve Nash can't hold his jock. Paul has led the Hornets from Nawlins' to the #2 playoff seed in the Western Conference with the likes of Jannero Pargo and David West, who are they? Exactly. Paul has gone an entire season averaging 11 assists a game to go along with his 21 points. Aren't impressed yet? More then ten games which Paul had over 15 assists (3; 20+ assists per game contests) It isn't like Paul is doing this against average teams, last month in a victory over L.A. the Hornet guard had 17 assists and 27 points, against the Spurs he had 17 assists and 26 points, and finally against Steve Nash and the Suns, never mind the 17 point victory Paul scored 25 points in the game and dropped 15 assists. Extending the careers of both Tyson Chandler and Peja Stojakovic, Chris Paul has contributed in large part to the double-double of Chandler and 17 points a night from the former Sacramento King. Need some more, Ok. Chris Paul leads the NBA in steals per game and assists per game all while averaging 21+ per night. While the Suns added Shaq, the Mavericks added Kidd, and the Lakers added Pau, the Hornets added the likes of BONZI WELLS and STILL they are have the second best record in the Western Conference and the second best record WITHIN the Western Conference. Say what you will about Lebron, but he does it in the East. 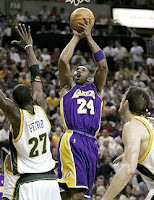 Bean Bryant, after all the sniffles were dried up from last summer Kobe decided to play with what he had. The likes of Ronny Turiaf, Lamar Odom, Jordan Farmer, and of course Andrew Bynum, how do I rip him I'd cry to if that was my support. The seven footer Bynum hadn't averaged more than 8 points and 5 boards a game in his previous two seasons, the Chicago Bulls wanted to keep Luol Deng instead of trade for perhaps the best player on the planet (that one worked out well Chicago) and the Boston Celtics had just traded their entire roster to give Paul Pierce a shot at the title. Meanwhile the Los Angeles Lakers signed free agent Derek Fisher and were banking on great things from Kwame Brown (When Michael Jordan gets the best player in a deal, you know your getting screwed), sounds fair enough to Kobe right? Then came old friend Jerry West who decided all he wanted in return for all-star seven footer Pau Gasol was a bag of donuts, two seats in the Viper Room, and Kwame Brown. Enter; The best combination in the Western Conference - Pau & Kobe. Seven letters in their first names combined and a #1 seed in the playoffs sounds like a fair deal to me. You know the drill, Kobe goes for 25-30 a night and decides passing the ball isn't such a bad idea except this time it's to Pau Gasol and not Luke Walton (Please if you think he has anything to do with the Lakers your nuts) avoids injuries and lead the Lakers back from the depths. You weren't going to give Kobe the MVP when he was scoring 40 a night; You didn't want him winning the MVP when he was on trial for sexual assault; and when you finally were going to use the excuse that Lebron is the MVP he promptly carried the Cavs to a 4th seed in the east (kind of like winning a bronze when 4 people are in the contest) When it comes down to voting for Kobe just remind yourself this: How much of the MVP is based on career accomplishments? After all that wouldn't you like to know who I'm voting for? That question was rhetorical. I throw my hat into the ring of . . . . CP3. Chris Paul deserves the MVP. The Hornets won the #2 seed without adding much at the deadline, they didn't receive gift wrapped superstars from the Timber wolves & Grizzlies just like the Celtics & Lakers did, and they are doing it with one of the worst run franchises in professional sport. Chris Paul is the New Orleans Hornets and he IS the 2007-2008 NBA MVP. May I remind you . . The smoke isn't clearing . .
March Madness: Day 9, WOW!